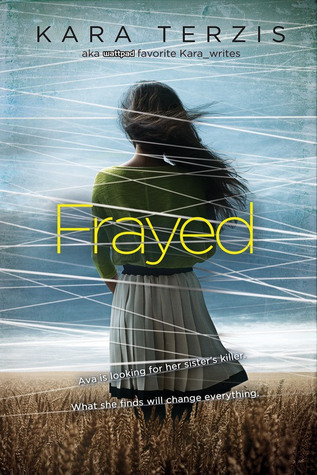 Frayed by Kara Terzis (her blog here) is a psychological thriller novel about finding someone’s murderer. Kara has been one of my biggest inspirations as a blogger and writer ever since I found her world building series online which was so helpful to me. I was super excited to read her book and have it sitting on my shelf as a reminder of what people can accomplish. Her story feels so much more real to me because I have been reading her blog for years. Here’s my review. I don’t read many thriller books or even many contemporaries so I didn’t know quite what to expect from this book. What I do love are strong characters and mysteries that aren’t easily solved, both of which were integral parts of this book. The characters all had more to them than what you first saw which is what you want in a mystery novel and I grew to love all of them. I especially loved the KARMA girls and I would love to see more of them in another book from Kara. The whole town feels like it has more stories to tell and I would love to read them. I found that Jackson was a bit of a one dimensional character and his role in the story felt unimportant but it was good to know that Ava had more than just one friend. Ava on the other hand was a really amazing character. It was good to see another version of a strong character. She had emotions, she wasn’t the assertive and independent woman who has become common in YA books. However she learnt to stand up for herself and she was able to defeat her demons, and that’s what a strong character is all about. I did feel like the story was a bit rushed and a bit more time could have been spent laying clues and having Ava follow the trail, but that might just be that I ready a lot of long fantasy novels. The beginning was a bit slow to start and some parts of the novel felt disconnected and unnecessary however later on in the book I appreciated all the time I spent getting to know Kelsey as a character. In fact I wish there had of been more of it, as much as Ava kept telling me how amazing Kelsey was I didn’t necessarily feel it. The ending was intense and kept me hooked, the plot twists were nicely reveled and not something I expected. As I was reading the book I kept trying to figure out who the murderer was and I have to say that when it was revealed I was shocked. I feel like there could have been a bit more foreshadowing but there are clues in there when you look back at the book.